Merchant and financier; born in Oberelzbach, Bavaria, Sept. 23, 1822; died in Baltimore, Md., March 1, 1899. In 1840 he removed to the United States. 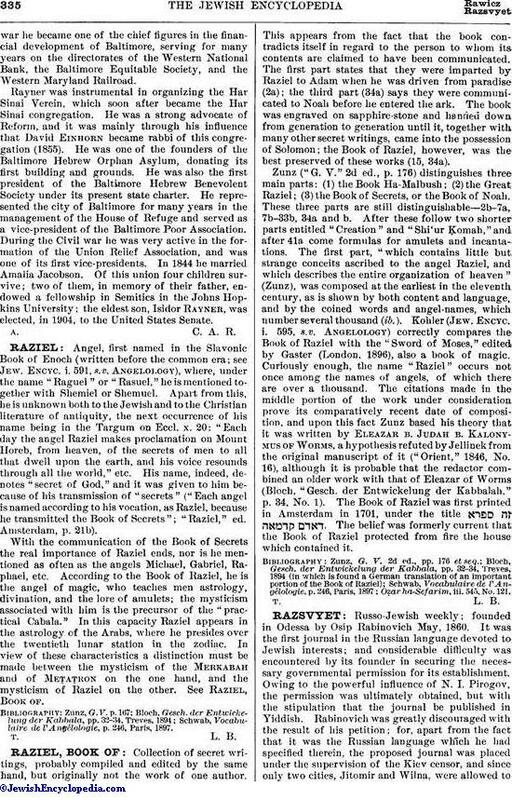 Declining an offer of the position of religious teacher in the old Henry Street Synagogue, New York, he removed to Baltimore, where he entered upon a successful mercantile career. At the close of the Civilwar he became one of the chief figures in the financial development of Baltimore, serving for many years on the directorates of the Western National Bank, the Baltimore Equitable Society, and the Western Maryland Railroad. Rayner was instrumental in organizing the Har Sinai Vercin, which soon after became the Har Sinai congregation. 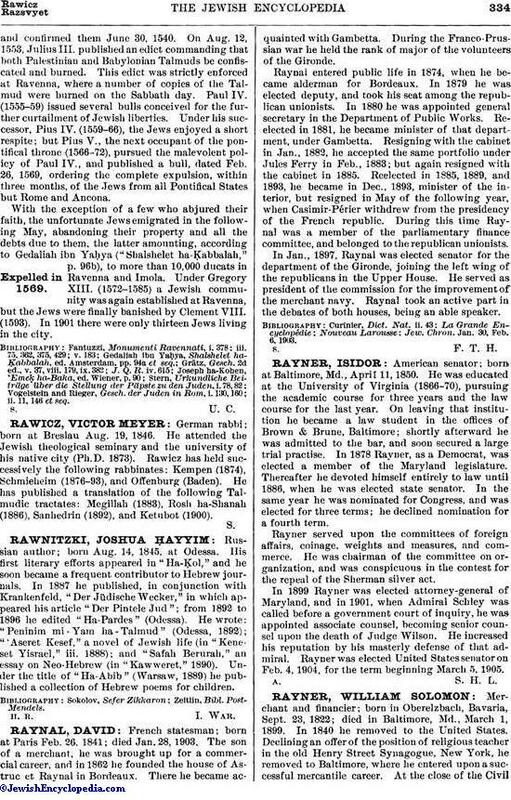 He was a strong advocate of Reform, and it was mainly through his influence that David Einhorn became rabbi of this congregation (1855). He was one of the founders of the Baltimore Hebrew Orphan Asylum, donating its first building and grounds. He was also the first president of the Baltimore Hebrew Benevolent Society under its present state charter. He represented the city of Baltimore for many years in the management of the House of Refuge and served as a vice-president of the Baltimore Poor Association. During the Civil war he was very active in the formation of the Union Relief Association, and was one of its first vice-presidents. In 1844 he married Amalia Jacobson. Of this union four children survive; two of them, in memory of their father, endowed a fellowship in Semitics in the Johns Hopkins University; the eldest son, Isidor Rayner, was elected, in 1904, to the United States Senate.